I wish all my desi readers a very Happy Independence day! I have many cherished moments as a kid when we used to assemble in our school grounds and sing "Jana Gana Mana...." our National Anthem. 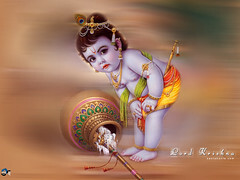 We used to get lot of chocolates and sweets on this day at school. I remember my father brings home these small flags we can tuck on our uniforms. Coming home after the flag hoisting me, my brother and sister used to count the number of chocolates we received from our class teacher/leader. Though who had some influence , chipped in most. Ohh so wonderful time spent with my brother and sister and my classmates! On this occasion I would like to tribute My Country, My Matrubhoomi (Motherland) this Tri-colour salad. The recipe is quite simple and I worked with colours primarily focusing on Saffron (Orange), White and Green. Sending this to Pooja for I-Day Event. Combine chopped spinach, grated carrot and feta cheese or if you are using paneer, then chop into small cubes. Toss them in a large salad bowl. In a separate small bowl whisk lemon juice with extra virgin olive oil, add salt and freshly ground black pepper. Pour freshly prepared vinaigrette into the salad and toss well. Before serving garnish with toasted pine nuts or any nuts of your choice. Variation: You can use crumbled or cubed paneer instead of feta or goat cheese. And any vinaigrette of your choice nuts are optional. 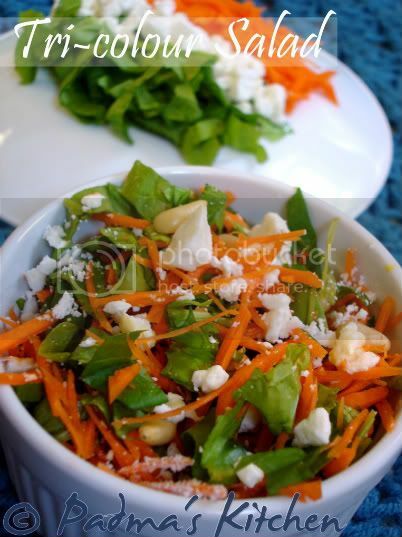 Wonderful tri colour salad Padma it look sso healthy and delicious. Salad looks so yummy !!! Never seen such a refreshing salad . thanks for your nice entry. Happy Independence day to you too. Beautiful refreshing one :) Happy Independence day! Just found your blog on Jersey Biters. What a pretty salad! Vandemataram! :) What a healthy way to celebrate our Independence day! :)) The peacock is simply superb! Very beautiful salad! healthy meal :) I love teh pic! wow.. lovely ,independance day salaad padma, first very beautiful then very nutritous..